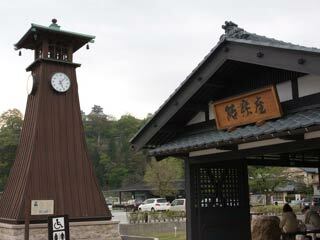 Echizen Ono (越前大野) is Kyoto Style castle town located eastern Fukui Pref. There are many historical sites and Edo style buildings in Ono. The town is know as "Little Kyoto," and it has over 400 years of historyOno is also famous for its pure water. There are many springs including Oshozu, one of the 100 best water in Japan. There is visitor's center near castle and samurai house. There is a parking which is very convenient to access to all the spots. ... is a hilltop castle located in Ono. It was built by Kanamori Nagachika in 1576. The layout of the castles, stone walls, moat and dirt hills are preserved in the great condition. There is a reconstructed Tenshu-kaku which has great view of Ono field. ... is the local morning market which sales fresh local products of Ono every morning. It happen from 7a.m. to around 11 a.m. There are many fresh foods, vegetable, sea products, snacks and other local folk crafts. ... is one of 100 best water in Japan. It is the main feature of Ono, Fukui Pref. Ono is famous for its pure underground water. There are many springs in this town. Oshozu is the most popular spring in Ono. It has soft taste of water. Many people come here and bring its tasty water for their daily use. ... is a temple street in Ono. There are about 20 temples on this street which give tourist the view of Kyoto. The city of Ono was built by Kanamori Nagachika in 1575. He built this city based on the layout of Kyoto. ... is the remaining Samurai house in Ono. It has beautiful garden and tea house where you can enjoy traditional tea. Uchiyama is one of Karo of Ono Domain. He helped the economic growth of Ono in the middle of 19th century.